Foraminifera (formally called Foraminiferida) are amoeba-like, single-celled protists (very simple micro-organisms). They have been called 'armoured amoebae' because they secrete a tiny shell (or test) usually between about a half and one millimetre long. They get their name from the foramen, an opening or tube that interconnects all the chambers of the test. Fossilised tests are found in sediments as old as the earliest Cambrian (about 545 million years ago) and foraminifera can still be found in abundance today, living in marine and brackish waters. The test of allogromiids is made out of tectin a soft, flexible organic material. Other foraminiferal tests are composed of organic matter, together with agglutinated particles of sand, silt or occasionally echinoid spines, radiolaria or diatoms, cemented together with calcite or silica. The tests of many foraminfera are made of aragonite or calcite, when the shell may be milky white (porcelaneous taxa), grey (microgranular taxa) or glassy (hyaline taxa). An imaginary planispiral foraminifer with some of the different kinds of ornament, and broken to show the internal structure. The test, which is the part that is preserved as a fossil, can take many different shapes. In some types of foraminifera the chambers are added in a spiral and take a number of forms. Heterostegina depressa (2.4mm across) and Amphistegina lessoni (1.3 mm) living on weeds in a rock pool in Hawaii. The last chamber of the test has one or more small openings (apertures). Protoplasm extrudes through the aperture to engulf the test of the living organism. That on the outside of the test makes long filaments which it uses for locomotion and capturing food particles. That inside the test is where the food is ingested and where the nucleus of the cell is found. Foraminifera feed on diatoms, algae, bacteria and detritus. The Proloculus is the first chamber of the test. It is small when the foraminifera has formed by sexual reproduction, but large when reproduction has been asexual. Protoplasm is the soft, jelly-like material that forms the living cell of the foraminifera. The most important factors that control living foraminifera are salinity and temperature, but other things like the substrate (weed, rock, silt, mud, sand, etc), the amount of light, and the amount of oxygen dissolved in the water are important. Many foraminifera that live in river estuaries and coastal waters are hyaline (e.g. Elphidium) or agglutinated types. In shelf seas, the porcelaneous species (such as Quinqueloculina) become more numerous. In the deep deas agglutinated forms predominate, mixed with the dead tests of planktonic species (e.g. Globigerina) which live near the surface of the ocean waters and rain down to the ocean floor on death. Foraminifera that lived in the geological past were also controlled by the environment. Thus fossils can be used to identify the conditions in which the enclosing sediments accumulated. They can be used, for example, to recognise glacial and warm episodes during the Quaternary; changes in salinity in the Cretaceous; variations in the oxygen content of the water in the Jurassic; sea level oscillations during the Carboniferous, and so on. Present day, agglutinated foraminifera live on the abyssal sea floor (4000 metres deep). Bathysiphon (bottom), Astorhiza (left) and Rhabdammina (right). Quaternary miliolid, Quinqueloculina (left) and rotaliid Elphidium (right) lived on weeds in Arctic shallow marine waters. Uvigerina (left), Gryoidinoides (centre) and Cibicidoides (right) lived in bathyal waters of the Palaeogene. Planktonic foraminifera lived in the photic zone (less than 200 metres deep), near the ocean surface during the late Cretaceous. Globotruncana (left), Globigerinelloides (bottom) and Heterohelix (right). Early Jurassic, hyaline Marginulina (left) and Frondicularia (right) lived in shallow marine waters of the continental shelf. Late Carboniferous agglutinated Ammodiscus (top) and Ammovertella (bottom) lived in brackish esturine water. Foraminifera from different geological periods as if seen down a microscope. All are between 0.5 and 1 millimetre long except the abyssal species which grow up to several centimetres. Peneroplis pertusus, reproducing by division to form many small juveniles. These will grow to produce the next generation. Although they formed asexually, they will, in their turn, reproduce sexually; sexual and asexual reproduction alternates. Juveniles are about 0.1 mm across. The stratigraphical range of some foraminiferal species is very short and they can be used to give a relative age to the rocks in which they are found. The rocks can be assigned to foraminifera zones, which equate with periods of time. Zones may vary in length from a few thousand to several million years. They allow correlation of geographically separate rocks. This is very important when making geological maps, exploring for oil or gas and building large civil engineering projects. Heterostegina depressa during chamber formation. Note the protoplasm extruded into long filaments. 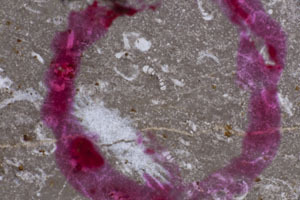 Nummulites gizehensis, Strabro's 'lentil': this magnified example is 2.8 centimetres in diameter but only 2 millimetres thick. Foraminifera were first discovered about 2 000 years ago! The pyramids in Gizeh, Egypt, are in part built out of a Palaeogene limestone which contains huge numbers of Nummulites gizehensis, a large foraminifer that grew to several centimetres across. "There are heaps of stone chips lying in front of the pyramids and among them are found chips that are like lentils both in form and size; and under some of the heaps lie winnowings, as it were, of half-peeled grains. They say that what was left of the food of the workment has petrified and this is not improbable." In the 18th century, people began to examine foraminifera in more detail with much improved microscopes. Foraminifera were first described by Beccarius in 1731 and the name Foraminifera was first used by d'Orbigny in 1826. Nobody was certain what they were, but some thought they might be worms, gastropods, corals or cephalopods. Several of the first species to be described were given the name Nautilus (see Ammonites). Platysolenites antiquissimus, showing a cross-section of one of the tubes (which is about two millimetres across) and although it is slightly squashed, the agglutinated sand grains and the tubular structure are clearly visible. One of the first fossilised foraminifera to have evolved is Platysolenites antiquissimus. It lived about 545 million years ago during the early Cambrian and has been found in rocks in Wales and in a borehole sunk below Oxfordshire. They are agglutinated tubes three or four centimetres long.